Please find below the Academy’s Curriculum information. 2017 sees a significant change in the way some GCSE subjects are graded. For Year 11 students in English and Maths, and for Year 10 students in all subjects, students will now be awarded grades 1-9 , 1 being the lowest and 9 being the highest. Whilst these new grades don’t fully compare to the old A*-G grades, grades 7-9 cover what was roughly the old A*-A grades, grades 4-6 cover the old B-C grades and grades 1-3 cover the old D-G grades. A good pass, like the old C grade, is now set at a Grade 5. 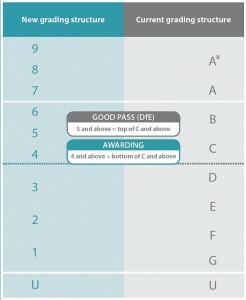 The diagram below outlines how the new grades match against the old GCSE grading system. If you need any further clarification about what your child’s grades mean, please do not hesitate to contact us.